Blue Orange Games are all about hot toys and a cool planet! Their award-winning games are designed to be simple, fun, and are environmentally sustainable too! Blue Orange select durable, feel-good materials to create games that last through the generations, and pledge to plant two trees for every one used in their games. How's that for commitment to the planet? 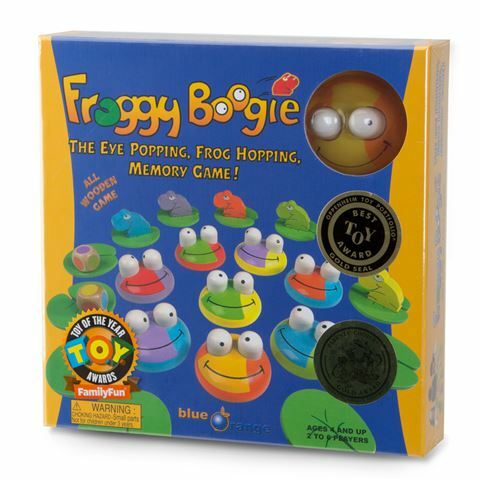 Now that you’ve made an earth-friendly choice, you just have to choose from Blue Orange’s fun game titles; Froggy Boogie is an eye-popping, frog-hopping memory game that’s also a bit of a race! In this all-wooden game, the baby frogs have to try to be the first to hop around the pond without being seen by the older frogs! Players guess or remember which adult frog popping eyes will freeze the baby frogs in the race, slowing the other players down. You’d be hopping mad not to try this one out! Recommended for ages 4 and older. Memory game for two to six players. Made entirely from sustainable wood. The baby frogs (players) must try to be the first to hop around the pond without being seen by the adult frogs. Player guess or remember which adult frog will freeze the baby frogs in their place. 9 x Adult Frogs with "Popping" Eyes. 11 x Small Water Lilies.